Lagoon Camp has a beautiful setting on the shady banks of the Kwando River among tall and ancient African ebony and marula trees, under the watchful gaze of the resident hippos. It accommodates 16 guests in 8 luxury safari-style tents which are more like huge airy rooms. Each tent has large netted windows looking out over the water making the most of the views. The rooms are spacious and airy and include a lounge area, and large changing area leading to the bathroom with indoor and outdoor showers and 24-hour hot water. The furnishings are luxurious with comfy leather chairs, Persian rugs and traditional claw-foot bathtubs. In the main area, there is an open-fronted split level lounge and bar area, leading out to the swimming pool on one side and the dining deck on the other, with a step down to the camp fire. The main deck is built out over the lagoon and has great views. The cosy library is located on the upper floor of the reception area and looks out over the lagoon deck. The shady environment of the camp hosts a great variety of birds and squirrels that visit daily. 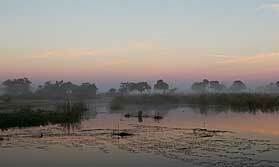 A family of hippo and an elephant or three are regularly sighted from the tents. This contributes to the relaxed calm that prevails at Lagoon Camp. Boat cruises along the Kwando River provide excellent opportunities for birding. There is also fishing on offer for tiger fish and bream. Seasonal walks are available too so it's a great allround camp. Lagoon Camp's excellent staff are there to look after you quietly and efficiently, so as to ensure a relaxing, peaceful stay in camp after the fun and excitement of your day on safari. Location: On the banks of the Kwando River in the Linyanti region. Rooms: There are 8 en-suite guest tents including a larger family tent. All are set on raised decks with private terraces. Inside there's room for easy chairs, a coffee table and desk, and a clothes storage area. The air is circulated by a ceiling fan, and mesh windows keep insects at bay. The bathroom has twin hand basins, a bath and shower. There's a separate toilet and an outdoor shower, too. Toiletries are provided. The family unit is positioned a little way away and has 2 bedrooms. 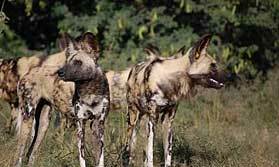 Activities: Game drives in custom-built vehicles, night drives discover the nocturnal life of the area. Guided walks are also available (subject to season). Boat cruises along the Kwando River provide excellent opportunities for birding. The double deck boat provides great views of the river and wildlife. Evening cruises are complete with sundowners. Fishing can be arranged with basic equipment available for guest use, though experienced fishermen may like to bring their own. Facilities: There is an open-fronted split level lounge and bar area, leading out to the swimming pool on one side and the dining deck on the other, with a step down to the camp fire. The main deck is built out over the lagoon with excellent views. There is a cosy library located on the upper floor of the reception area. There are charging points in the bar and the office. Dining: Meals are served communally at one long table. Children: Children aged 6-12 yrs are welcome but the family are required to book a private vehicle. Children under 6 are accepted but only if reserving the entire camp for exclusive use. Communication: There may be some mobile phone reception but this can be unreliable. "Fabulous location again very close to wildlife. A little 'over the top' in terms of size of accommodation and not completely in keeping with the bush environment. Needs to provide sun shade on decking areas outside accommodation. Food excellent. Guides amazing (Mugadi and Aaron), tracking prides of lions with us." "A happy and friendly camp where the food is of top quality and the portions generous! The wine is good too!!" "Wonderful. From the first welcome to the goodbye we had a fantastic time. Our lodge was huge and very comfortable. It is difficult to think of anything we lacked." 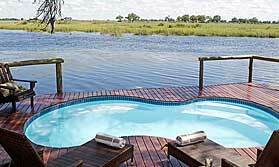 "Kwando Lagoon camp was very good, we enjoyed our stay very much. Guide Spencer and manageress Lebo, tracker Ike, the other guide and tracker, and all the cooks and ladies were so very friendly, the atmosphere in camp was fun and sociable. The camp fire was going every morning with breakfast served from hot iron pots on the fire, everyone sat round the fire warming up and talking about what the day would bring. Same in the evening, camp fire welcoming us back after the game drive, letting us have time to have a drink before dinner. Meals were congenial and friendly, with the guides joining us every night to join in the banter. Spencer is a legend, his guiding is so enthusiastic, he has not lost his love of every aspect of the wildlife, he calls it his paradise. Lagoon camp has got it right, we would definitely stay there again. "